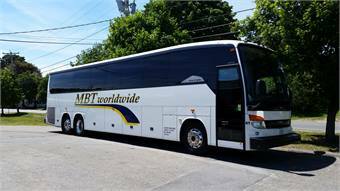 When it comes to motor coach transportation, Boston-area MBT Worldwide likes to keep its coach fleet modern, and costs moderate, passing savings on to customers. The company, which runs a wide variety of vehicles, added three new Setra S 407 coaches last month for that very reason. “We like the look of Setra’s European styling and the value,” said Russell Libby, owner, who runs MBT Worldwide with other family members. The Setra S 407 Comfort Class, like the luxury Setra S 417, distributed by MCI in the U.S. and Canada, offers German engineering and a clean-power Mercedes-Benz BlueTec engine. Safety features include an Electronic Stability Program, all-wheel disc brakes, and ABA braking with anti-slip control. Passengers will enjoy many onboard amenities from extra comfortable seats to video monitors. Libby, who was an electrician prior to joining and later buying out his father-in-law’s airport flight-crew shuttle business, is a stickler for a well-maintained fleet. 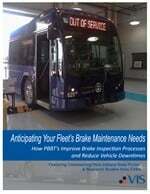 MBT’s 10 coaches, mostly MCI and Setra models, are cared for by MBT mechanics at the company’s own maintenance shop. When issues arise, Libby counts on MCI’s aftermarket support and in-field representatives. People feature prominently in the success of MBT, which serves a wide variety of clients, including schools, athletic teams and corporations. Libby credits his nephew, Craig, along with other family members and staff for the company’s 30-plus-percent annual growth rate.